Being a “doer” vs. a “thinker,” and where you’ll go for New Orleans beignets. When I arrived in New Orleans on Thursday to attend the annual SPSP conference, everyone told me that I must immediately go to Cafe du Monde to eat beignets and drink cafe au lait. Once I did get to Cafe du Monde, imagine my surprise to discover two things. First of all, it was not the easy “walk in, order beignets, enjoy” process that I was delusionally expecting. Secondly, I soon discovered that cafe au lait and beignets were, in fact, the only things that they had on the menu. 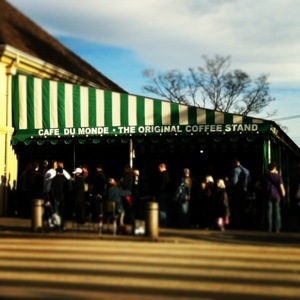 There’s no doubt that Cafe du Monde is renowned for their beignets. But let’s imagine for a second that there were a Starbucks right down the street, and this Starbucks had managed to create incredible beignets as well. If you were coming to New Orleans and wanted to enjoy a midday pastry with some friends, where should your group decide to go? Should you tell Facebook about your resolutions? Now that you’ve set your difficult, specific, and attainable resolutions for 2013, should you tell people about your plans? Before you update your Facebook status proclaiming your intention to lose 15 pounds, run a marathon, or publish 20 papers, you should think about your reasons for broadcasting your plans to the world. If you’re thinking about this public commitment the wrong way, you might be setting yourself up for disaster. Set SMART resolutions in 2013! Many people around the world woke up this morning with a renewed determination to tackle a long list of resolutions. But as we head into 2013, it’s worth noting that some of these resolutions will be better than others. Psychological research on goals can clue us in to which resolutions will be more likely to end in success, and which will probably end up flopping before the snow even melts. Where will you be voting? Figure it out now! With everyone talking about the importance of “voter turnout,” how do you make sure potential voters make it to the polls? Simple – make them figure out ahead of time how and when they’ll get there. I’ve provided links below to all eight PsySociety posts on the psychology of the Olympic games. Click on the links to learn more about what blind judoka can teach us about emotions, how to predict which record-breaking athletes will be accused of drug abuse, why it’s so bad to be in the last lane of the Olympic pool, and more! Why do swimmers hate Lane 8? Before I went to college, I was never a big basketball fan (for those who know me now, I’m aware that this is probably surprising). As a result, when I arrived for my freshman year at Duke and began attending a ton of basketball games, I had the opportunity to learn an entire dictionary’s worth of terms for the first time. One of the phrases that I quickly heard was “playing down.” Even though we were highly ranked and expected to do well later in the season against big-ticket teams like the #2 Texas Longhorns (who we eventually beat by 31 points), I was somewhat surprised by the fact that our margins of victories over early opponents were, quite frankly, not as impressive as I had expected them to be. “Ugh, we’re playing down again. We always do this,” my friend Leah would say. It wasn’t intentional. The players probably didn’t want to run up the score, but they also probably didn’t want to make every game against a low-ranked opponent a too-close-for-comfort nail-biter. You would think that, given the large difference in rankings (and presumably in ability levels), the better team should be able to maintain a respectable 15-20 point lead — wide enough that no one had to worry about the outcome, but close enough that it wasn’t rubbing the score in the other team’s faces. 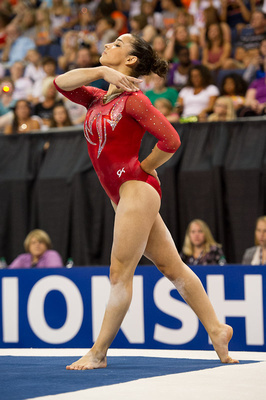 You ask [Aly Raisman] about feeling the pressure and she says, ‘I don’t really feel it,’ and you know, I think it’s because she labels it something different in her head. Some kids feel anxiety, feel pressure, she feels excitement. It’s just how you label that. When you’re faced with a high-pressure situation, like giving a public speech, taking an important exam, or performing in an athletic competition, it’s only natural to assess whether or not you are adequately prepared. Are you ready to compete? Are you fully rested? Do you remember your notes? According to the biopsychosocial model of challenge and threat, these appraisals can lead you to construe the same situation in markedly different ways. If you have enough resources to deal with the situation, you are more likely to view it as a challenge; if you do not, you will perceive the situation as a threat. These different perceptions (or construals) don’t only impact the literal way that you identify and label these events; they have distinct physiological and functional outcomes as well. PsySociety uses psychological research findings to examine and understand pop culture & current events - sports, TV shows, movies, music, historical happenings, and more. To learn more about me, check out the About Me page or my Personal Website. I also wrote for IonPsych with several other psychology grad students at the University of Illinois. My posts for IonPsych can be found here. Come see PsySociety at its new home! New APS replication initiative aims to open the file drawer, heralding a positive step for psychological science. Submit A Post To Open Lab! If you like anything you read here, please consider submitting it for consideration in Open Lab 2013! Who runs the world? Not girls. Fear and love on a shaky bridge. Casey's case: What psychology says about Anthony's acquittal.